From the power production plant to the consumer, electrical energy follows a complex path requiring a large number of measurements in the field. • Thermal, hydroelectric, nuclear, solar or wind power plants. • A system for transmitting and distributing this energy via high-voltage and then low-voltage networks. • An electrical installation in a building. The main challenge for this technical chain is to ensure a safe, reliable supply of electrical energy, i.e. in compliance with the standards. To ensure that this quality of service is achieved, the actors in the sector perform a large number of measurements when commissioning or carrying out preventive and corrective maintenance. Chauvin Arnoux has a broad offering of measuring instruments specially designed for these operations. Electrical safety from the distribution network through to the installation in the building is a major issue in terms of protecting people and property. This field, closely controlled by standards, recommends or requires checks on essential characteristics of the earthing circuit, insulation resistance, continuity of the conductors and the protective systems. Earth testers can be used to measure the resistance of an installations earthing, or in other words, its ability to drain a fault current without dangerously increasing the resulting voltage. Depending on the installation's topology, the measurement may be performed using the classic measurement method with stakes or a selective method, particularly when the environment does not allow the use of stakes. Lastly, when the earthing is provided by a network of multiple earths in parallel, earth clamps can be used to determine the characteristics of the earth network. The main reason for measuring the electrical insulation of a cable or other item is to prevent problems due to ageing of the materials. These measurements considerably reduce the hazards for equipment (short-circuit and fire) and people (risk of electric shock). According to the characteristics of the device to be tested, the operator will determine the test voltage to be applied. Chauvin Arnoux insulation testers capable of performing tests up to 1,000 V, 5,000 V and 10 kV – 15 kV are ideal for this task. In addition, Chauvin Arnoux offers instruments capable of performing specific tests for electrical energy transmission and distribution equipment, such as earth testers for networks of pylons, micro-ohmmeters and ratiometers. To meet the electrical installation testing and maintenance requirements, Chauvin Arnoux proposes bi-function or multi-function installation testers capable of performing all the tests stipulated in the national and international standards (IEC 60364-6, NFC 15100, VDE100, etc.) with a single instrument. - the absence of any heating at the terminals, etc. The thermal image obtained with the camera shows the different temperature zones, giving a quick, simple overview of the temperature differences. Once the anomaly has been located, repair operations are quicker and the risks are limited. Thermogram allowing users to check whether the current is evenly distributed at the different terminals. The quality of the electrical power distributed is a crucial technical feature for ensuring optimum operation of an electrical installation. It is measured by determining whether there are disturbances and abnormal events on the voltages, currents and frequencies. The source of these electrical anomalies may be the usage segment (distribution system or electrical loads on the consumer's side) or the supply segment. A deterioration of the electrical power quality may cause production losses or shutdowns and higher energy bills linked to the consumption profile. Chauvin Arnoux's Qualistar+® network and power analysers measure all the voltage and current parameters for electrical power quality diagnostics. The functions of these instruments can be used to acquire and record simultaneously all the parameters concerning transients, alarms and waveforms which can then be analysed with the DataView® software. This makes it simple to check the values against the standard templates. A list of parameters to monitor, uniform terminology for the definitions and help with interpretation of the data have been defined. Energy quality depends on at least twelve key parameters of the electricity supply, including the frequency and the voltage variations referred to above. However, the most critical factor is the distortion of the waveform or the harmonic content. Harmonic voltages may cause malfunctions in sensitive equipment: RCD detection circuits, UPS switches, overheating of conductors. The solutions proposed by Chauvin Arnoux monitor compliance with the templates as defined in Europe by the EN 50160 standard or in North America by the CBEMA curve. EN50160 defines the acceptable limits for variations and the number of events tolerated. The level of the load on a transformer should also be monitored when there are harmonics present. The K Factor (K Factor Case Study) defines the derating of this electrical source. All these disturbances can be identified very easily with power and energy analysers. In the field, it is more efficient to perform simple, on-off tests or measurements allowing rapid diagnosis. 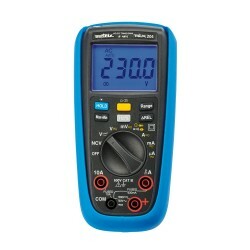 For this, professionals use a multimeter because of its universal capabilities and measurement ranges, or a multimeter clamp, which allows them to determine the current values in total safety, without contact or mechanical operations on the installation or the conductor. It is crucial to select these two types of instruments carefully in order to achieve a pertinent diagnosis. Taking advantage of its long experience, Chauvin Arnoux commercializes a wide range of products offering acknowledged functions, safety and rugged design. • Low-impedance voltage measurement with low-pass filter. User safety is another aspect which must not be neglected. Compliance with the standards (IEC 61010, etc.) is necessary but insufficient if the requirements are not matched to the operating conditions. So if you choose CAT IV 600 V or 1,000 V instruments, you can work on all Low-Voltage applications. As all the elements in the measurement line contribute to safety, this requirement is also applicable to the measurement accessories. Lastly, the quality of the instrument's design and manufacture is also an important parameter when choosing products. The mechanical and electrical specifications which ensure safety must be preserved over time. In conditions involving pollution (dust, humidity, etc. ), a high protection rating (> IP54) ensures that the instrument remains leakproof. Every professional knows that electricity is never entirely risk-free. This is why they should try to work as much as possible with the power off. While most professionals already follow this good practice, some countries and customers impose it as an obligation. "2° It must only be possible to re-establish the voltage in the part of the installation concerned after removing the separation and only if re-establishment of the voltage does not cause any risks. Part 1 of the EN 50110 standard contains the minimum specifications applicable for all 115 member countries of CENELEC, as well as informative appendices concerning work safety on, with or near electrical installations. A check on the absence of any operating voltage must always be carried out before starting work. If voltage absence testers or voltage detection systems are used, they must comply with the EN 61243 European standards. Chauvin Arnoux's Voltage Absence Testers (VATs) are important instruments for electricians' safety which are simple and effective because they accompany electricity professionals in the everyday work. Compliant with Edition 2 of the IEC 61243-3 European standard, they include a redundant voltage detection system and comprehensive self-testing is necessary to ensure that they operate correctly. Their CAT IV 600 V rating allows work on all categories of LV installations and their high ingress protection (IP65) means they can be used both indoors and outdoors. Economical and praised by many professionals, the test-probe accessories and cables are removable and replaceable and can be used with accessories which comply with the IP2X standard.